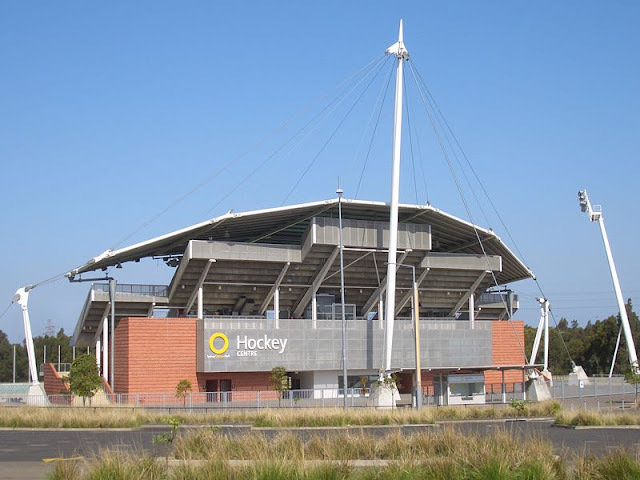 The Hockey Centre at Sydney Olympic Park, is one of the stadiums built for the Sydney Olympic Games in 2000, in the western suburb of Homebush Bay. It took me a moment to think it over- field hockey. Not ice hockey. Ah, yes. Field hockey is played more in Australia than ice hockey. I'm not much of a hockey fan, but I think that could change if I understood the game better! We do have a professional hockey team in a neighboring town - perhaps I should go, accompanied by someone who can inform me what's going on. Interesting building. Reminds me of a ship. A very clear sky. Enjoy your weekend. Nice building, I hope that it is used. Yogi, yes it's still in use.